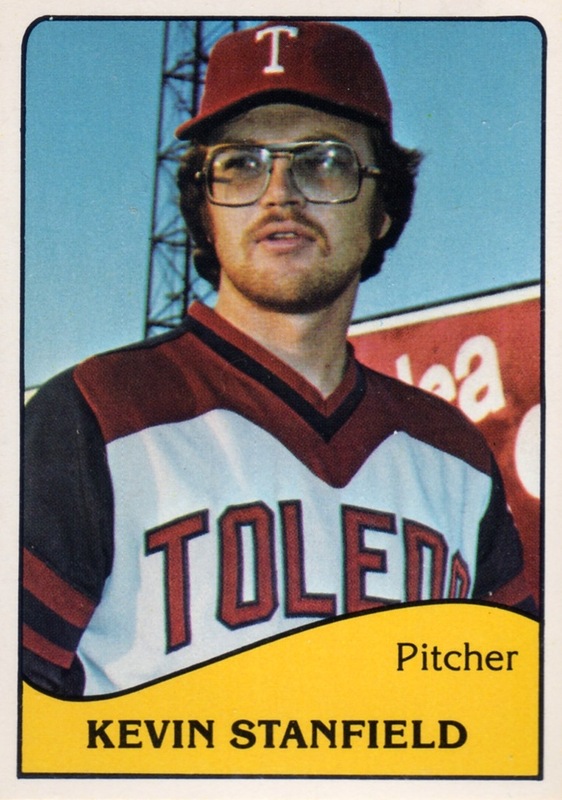 TCMA published more than 40 minor league team sets in 1979 and covered a surprisingly wide range of the country, from Hawaii's Islanders to Buffalo's Bisons. Checklists include 20 - 30 players each and picture many 1980s MLB stars, since most were only a step away from the bigs. My favorite card so far is of future intimidator Dave Stewart, who appears on Albuquerque Dukes #5. 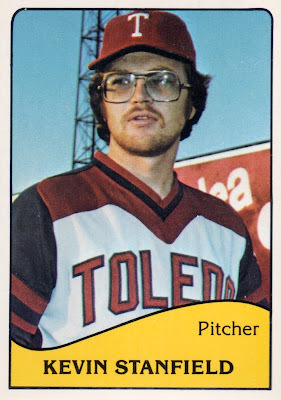 Toledo's uniform used an unusual combo of dark colors and military striping that year; it reminds me of a band leader. Or maybe, given the big glasses and several days of beard, a 1970s narcotics investigator going undercover as a band leader. The Mud Hens remain one of the best-known minor league teams, thanks to their distinctive name, long local history (playing since 1902, with one break following WWII), and 50+ years as a AAA affiliate for MLB teams. Toledo opened a new downtown stadium in 2002; if you're in the area, they're running an interesting series of fan promotions this home stand (April 22 - 25, 2011). Spring Cleaning Giveaway: first 1000 fans receive a giveaway from seasons past. What will you get? Royal Wedding Rehearsal: first 1000 fans in the ballpark will receive a Prince or Princess crown! I'm a big fan of the last one, as getting onto a manicured pro field also feels like a special treat, especially for kids. Even the Kingdome's artificial carpet felt like heaven the two times I got to walk around on it in 1979. 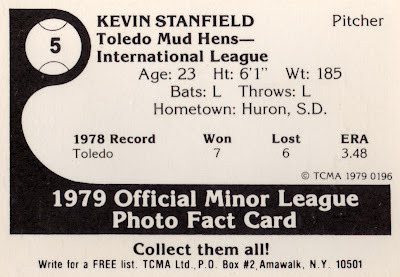 Value: Like many of my TCMA cards, this cost $2 at MinorLeagueSingles.com.